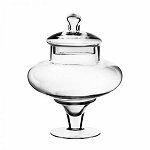 These Glass Apothecary Candy Jars are a set of 3 jars in varying sizes and shapes to really add a decorative touch anywhere you choose to set them up. Events which include a candy buffet should definitely take a close look at this set. Fill up each apothecary jar with colorful candy to match your events color theme and provide a range of candies for guest. These jars create a beautiful table display and you can tie ribbons around the top of the lid and other personalized little touches. 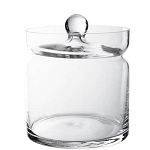 Each glass candy jar has a wide opening so scoops can easily retrieve contents out for you. Candy shops can create the look of the old fashioned general stores and shops. Bring back memories and create new ones for shoppers when you line your shelves with the varied sizes of jars and fill each with bulk nostalgic candies Have a great time organizing your pantry, kitchen, and bathroom cupboards and counters with glass jars. 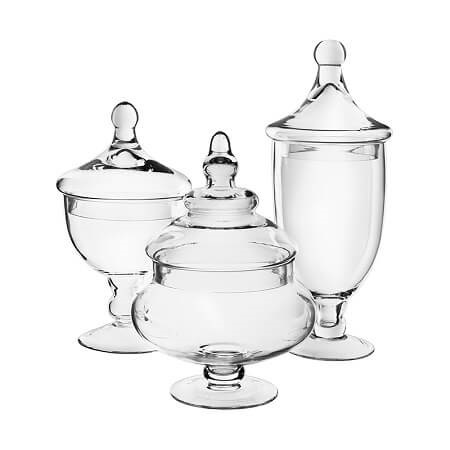 Your home will look neat and orderly as well as a beautiful touch of the glass shaped jars with lids. Decorative bulbs, lemons, and other creative items can be placed into each glass apothecary jar for great centerpieces at home or at events. There are just so many ways to use and reuse these gorgeous jars so be sure to order yours today!